Wie bisher ist und bleibt der Encoder kostenlos. 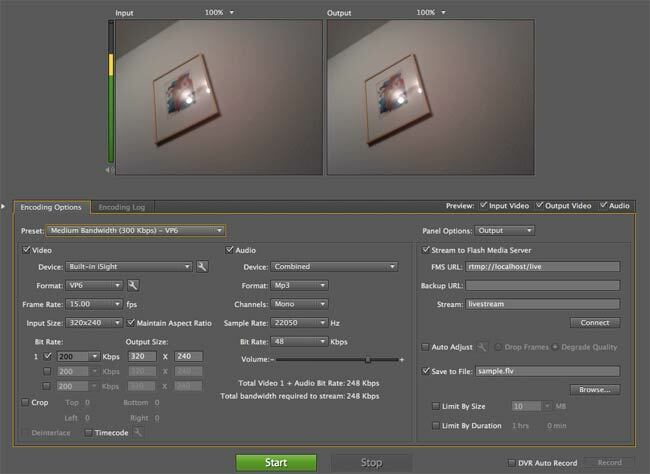 Der Flash Media Live Encoder (FMLE) funktioniert selbstverständlich mit der eingebauten iSight-Kamera. Außerdem werden Firewire-Kameras oder Video-Capture-Karten unterstützt. FMLE 3.1 will allow you to capture and create great live content from your MAC and from your PC. We’ve added support for recording up to 3 separate encodes to disk and auto adjusting the bitrate to help ensure high quality of service even if your network conditions change.